The Football Club released season ticket information and put sesason tickets on sale this morning, and we are happy to re-produce it all below. We would draw your attention to a couple of points that are included in the faqs. Season tickets are no longer available from our Kingswood shop. Share Scheme members that previously received a discount on their Season Ticket through the share scheme or helpline will now instead, receive a store voucher for the same value. We are delighted to announce our season ticket prices for the upcoming 2018/19 season. Our season ticket prices will once again offer Rovers’ supporters great value in supporting their side at the Memorial Ground. 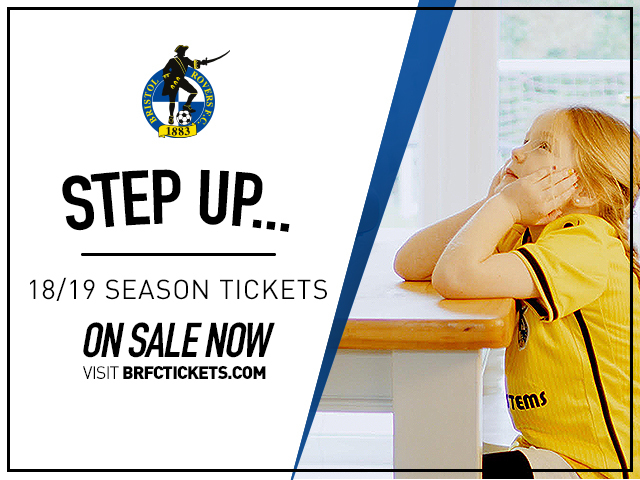 The main focus is junior season tickets, with U-11 prices starting at just £1 per game and U-16s able to purchase a season ticket from just over £5 per game. All junior season ticket holders will also include membership to the Young Pirates Junior Supporters Club as part of their ticket. Adult season tickets, begin at under £12 per game with Over 65s and Under 21s starting at just over £6 per game. Current season ticket Holders will have until Monday 16th April to renew for season 2018/19 at the current renewal price. Following this date, tickets will go on general sale at an increased price. 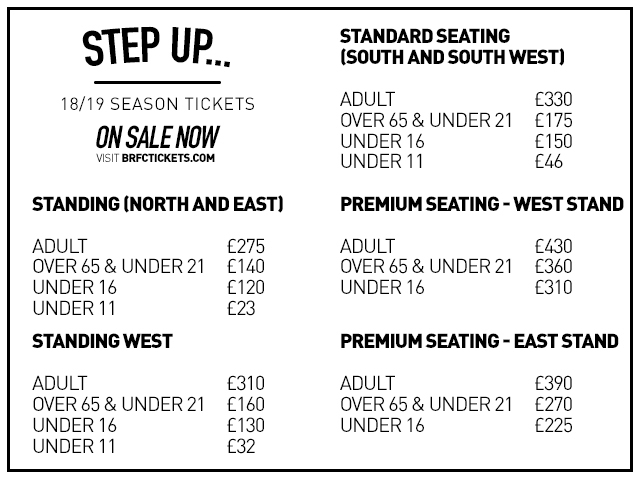 This season we have found it necessary to make small increases in prices across the board, but we believe that our season tickets offer value for money, especially for our younger supporters. The season ticket will also remain the cheapest way to watch all Rovers’ 23 home league games next season. The percentage increase is marginal for adult season tickets, with the average increase just 3.4%. However, the increases for supporters in the Over 65 bracket will be higher. The reason for the larger increase for supporters in this bracket are that in the past supporters in that group have been charged the same as the U-16 junior prices, whereas now they are in line with the U-21 prices. This change brings the club in line with almost every other EFL club and whilst the percentage price increase may appear to be on the high side, those over the age of 65 will still be able to watch matches at a greatly reduced rate. For example, those in the Poplar (East) Stand will pay the equivalent of under £12 per match. Season ticket holders will also receive specific offers to bring friends to The Mem. Others include priority booking for Cup and Play Off fixtures, the option to pay over ten monthly instalments and priority booking for away games. Those renewing their season ticket have the added bonus this year of being able to purchase tickets at a slightly discounted price from those purchasing for the first time. In addition to the above, there is also one other significant change for next season, in that the club will now be switching to electronic access from the 2018/19 season. This will mean that season ticket holders will receive an electronic card, as opposed to a paper booklet. Due to this, the window to purchase season tickets is shorter than in previous seasons, as these will need to be produced and mailed out ahead of the new campaign. Please note, that no season tickets will be available for purchase from the Supporters Club Store in Kingswood. However, supporters wanting to renew their Supporters Club membership, can do so when purchasing through any of the above channels. We ask all supporters to please ensure that your contact details are up to date on our ticketing system whichever means you choose to renew by. We would like to thank all supporters for their continued support and we look forward to seeing you all back at the Memorial Stadium for the 2018/19 season. To view a list of Frequently Asked Questions about 2018/19 season tickets please click HERE. If you want to know more about the how to renew your season ticket online, then please click HERE for a step-by-step guide to the process.